The Book Chook: Children's Book Review, Where Are Santa's Pants? 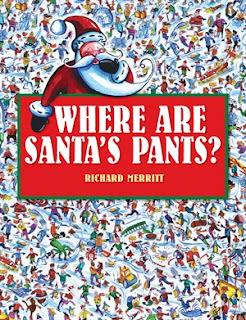 Children's Book Review, Where Are Santa's Pants? Need another suggestion for a bookish Christmas gift? Where Are Santa's Pants? is a great choice for a stocking filler. Created by Richard Merritt, it was first published by Little Hare Books (2010), an imprint of Hardie Grant Egmont. I LOVE puzzle books, (as you probably picked up in my Where's Wally review), and I know kids do too. Apparently dieting has caused Santa's pants to fall off, so he needs help to find them. But that's not all children must do - there are other visual problems to be solved on each page. HO HO… Oh No! Santa's lost his pants! It is the middle of Christmas, the crowds are out in full, and Santa has lost his pants. The trouble is, he doesn't know where he lost them. Was it at the department store? Was it on the beach? Was it at ice rink? Or was it at the railway station? This ultimate seek-and-find puzzle book is crammed with hilarious detail … and Santa's pants are to be found somewhere on each spread. The spreads in this children's picture book are nicely detailed so finding something specific isn't easy. A cursory glance won't locate the pants! There are also lots of tiny scenes to be exclaimed over and shared with friends. Kids learn that problem solving takes application and perseverance by completing puzzles, and have fun at the same time. Win/Win! 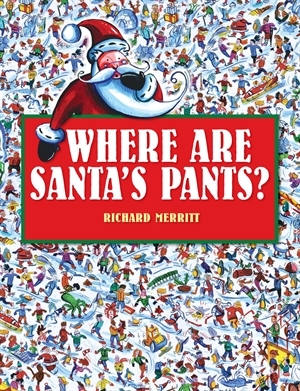 Read KBR's review of Where Are Santa's Pants? Find more bookish suggestions for Christmas at The Book Chook in Ideas for Children's Christmas Gifts, or by clicking Reviews in the sidebar at right. A very good book for children to read to.